Our readers, and fans in general, will always be divided on the standout (good or bad) film in the franchise, Friday The 13th Part 8: Jason Takes Manhattan. In many fan's opinions, Part 8 offered Kane Hodder's definitive portrayal of Jason Voorhees. Although the night stalker image gives the character an edgy look, the face designed for Jason is less than appealing. 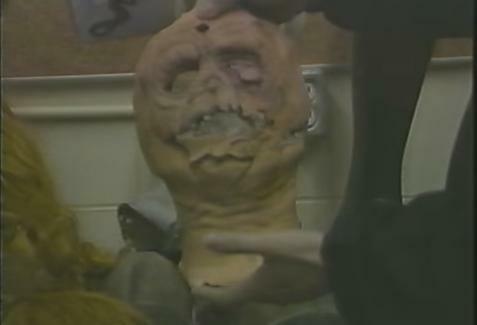 With that being said, we love to see the props and costumes preserved from the films, even the latex masks created for Jason's face from Part 8. Knowing our love for seeing archived items from the films, the following video makes many of us cringe! Tibor Farkas was an assistant make-up effects artist during the production of Jason Takes Manhattan in Vancouver and as such he handled many different effects of the film. During the video below, he discusses his time working on Part 8 and pulls out a latex mask of Jason's face that was created for Kane Hodder. What happens during his conversation will make collectors eyes pop out of their head. It is funny to watch the leisurely way in which Tibor handles a piece of history from the franchise, but he probably never realized how many people almost 30 years later would love to have that mask in their possession. Many thanks to Jason Farrell for sharing this in the Facebook group.